The Carbon County seat of Jim Thorpe (formerly Mauch Chunk) is 14 miles to the east. The district is 17 miles east of Pottsville (Schuylkill County seat and center of the southern anthracite field); 12 miles south of Hazleton, center of the middle field, and 35 miles northwest of Allentown. The borough is bounded by Schuylkill Township at its north and west, Walker Township at its south and west, Rush Township at its north, and the Borough of Coaldale at its east. The Little Schuylkill River, the West Branch of the Little Schuylkill River (Wabash Creek, mostly underground in the borough) and Panther Creek flow into each other in Tamaqua, joining the West Branch of the Schuylkill River at Port Clinton. Tamaqua is situated in a dell, between the Sharp and Locust mountains, between 800 and 1,000 feet above sea level. It is surrounded by steep hills: Sharp M ountain at the west end of the southern boundary; Mount Anthracite (Odd Fellows Cemetery) at the west; Locust Mountain at the west end of the northern boundary; Nesquehoning Mountain at the east end of the northern boundary; and Pigsah Mountain at the east end of the southern boundary. Strip mines, now under reclamation, parallel the borough at north and south. The Greenwood Colliery (originally the Tamaqua Colliery, it now borrows the historic name of that first colliery) is active at the borough’s southeast just beyond the district boundaries. Panther Creek and crosses East Broad Street in the 400 block. The abandoned western route to Pottsville exists as a string of vacant properties (alleys, parking lots, rear yards) running along the former Wabash Creek bed to the National Register-listed Reading Railroad Terminal Building at North Railroad Street. Other major streets in Tamaqua include: Greenwood Street, the major north/south street east of Five Points; Cedar Street, which connects Center and South Greenwood Streets and crosses the Little Schuylkill River; Nescopec Street, a north/south street crossing West Broad Street in the 200 block of the commercial district; Swatara Street, a north/south street crossing West Broad at the 300 block; Lehigh Street, a north/south residential street crossing West Broad at the 400 block; Lafayette Street, an east/west street at the western north of the district; Rowe Street, an east/west street between West Broad and Lafayette Streets; Cottage Avenue, a narrow residential street south of and high above West Broad Street; and Mahanoy, High, and Vangelder Streets, all residential streets in the South Ward, south of Cottage Avenue. Hazle and Arlington Streets are c. 1900 residential streets in the East End, running northeast. 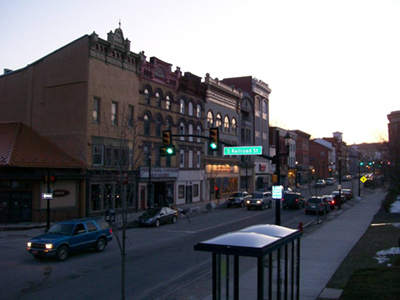 The Tamaqua Historic District incorporates a traditional central business district surrounded by residential development. 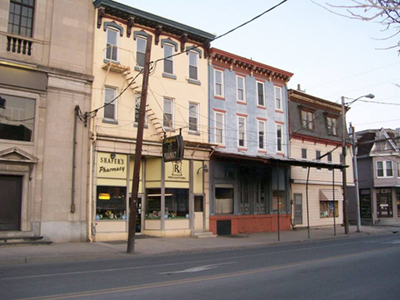 The commercial district extends from the Five Points intersection west along Broad Street into the 300 block; east along Broad Street to the 400 block, north through the first block of North Railroad Street; northeast along Mauch Chunk Street to the 100 block; and south along Center Street to the southern district boundary. Its two- and three-story buildings are tightly spaced, often attached to each other and with facade elevations flush against the sidewalk. The first neighborhoods in the district grew around two early borough centers at the western end of West Broad Street and on higher ground at Market and Mauch Chunk streets, which rivaled for early community dominance. Residential blocks generally are similarly sized and styled with most dwellings of the mid- and late-Victorian vintage. Most dwellings are tightly spaced on urban lots that are at least twice as deep as they are wide and are often banked into steep hillsides sitting well above the street. Front lawns are shallow, usually no more than 10-20 feet, with row houses built closer to the street than single family homes. Planned blocks are rare, except in the East End where lots are identical and residences follow several distinct vernacular patterns. Landscaped lawns with mature trees are rare but are found on northern Lafayette Street and East Broad Street. Arlington Street boasts shallow, raised front lawns with crennelated stone fences. Churches and public buildings are generally found on or in close proximity to Broad Street. Schools are found on Broad Street and in residential neighborhoods. The Odd Fellows Cemetery, an 1865 garden cemetery, is at the western terminus of the district. St. Jerome’s Cemetery, dating from c.1837, is located on High Street. 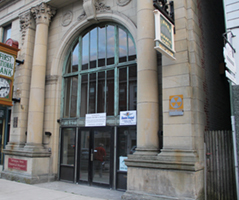 Industrial buildings are also scattered throughout the district, generally along rail lines situated adjacent to and often behind residences and commercial buildings. Those surviving within the historic district are of varied form and generally in the East End. 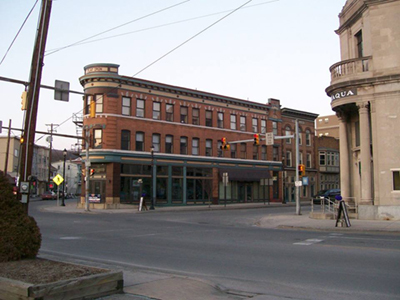 The overall mixing of building functions and property types give the Tamaqua Historic District a cohesive character. Tamaqua is a well-cared-for community and the historic district’s resources are generally in good condition.